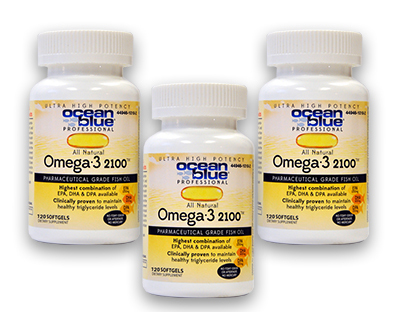 Ocean blue® Professional Omega-3 2100™ is the most potent omega-3 fatty acid supplement on the market, with or without a prescription. Each two-capsule serving provides 2,100 milligrams of Eicosapentaenoic Acid (EPA), Docosahexaenoic Acid (DHA) and other omega-3 essential fatty acids. Natural citrus oil means no “fish” burps or smelly fish taste. It does not contain gluten, sugar, lactose or dyes.